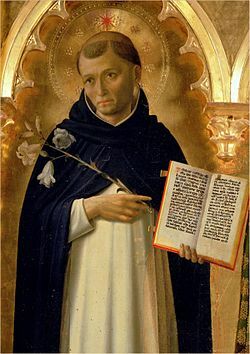 St Dominic was born in Calaruega, Spain. He was educated at Palencia, devoting six years to the Arts and four to Theology. During his studies, he joined an Order that followed the rule of St Benedict and at the time of the great famine, he sold his entire possessions to help feed the hungry. In 1215, St Dominic established a preaching group who followed strict monastic practices of prayer and penance. By 1217, the group was formally recognised and known as the Dominicans (Order of Preachers). St Dominic’s base was Rome but he travelled extensively to manage his ever growing number of friars. The Rosary is traditionally attributed to St Dominic, although prayer beads were already in use for probably many centuries before his time. It is believed that he preached its use following a vision from The Blessed Virgin Mary who held a set of rosary beads in her hands. The Dominicans continue to preach the power of the rosary today. St Dominic’s Feast Day is the 8th August. He is the Patron Saint of Astronomers and the Dominican Republic. Pray for me that I may be safe from the distractions of our material world and increase within me all that is spiritually good.